Appleton lead’s Bake’s entry to match racing season championship. Chris Bake’s Team Aqua, led by New Zealand skipper Cameron Appleton, today won the match racing portion of the ORACLE RC 44 Cup Miami. 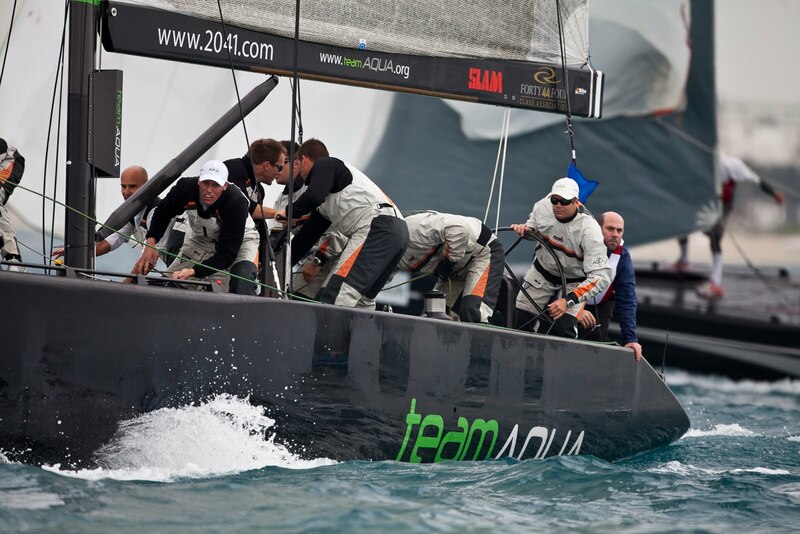 The close victory over Torbjorn Tornqvist’s Artemis Racing, led by American skipper Terry Hutchinson, also gave Team Aqua the season championship under the match racing format. 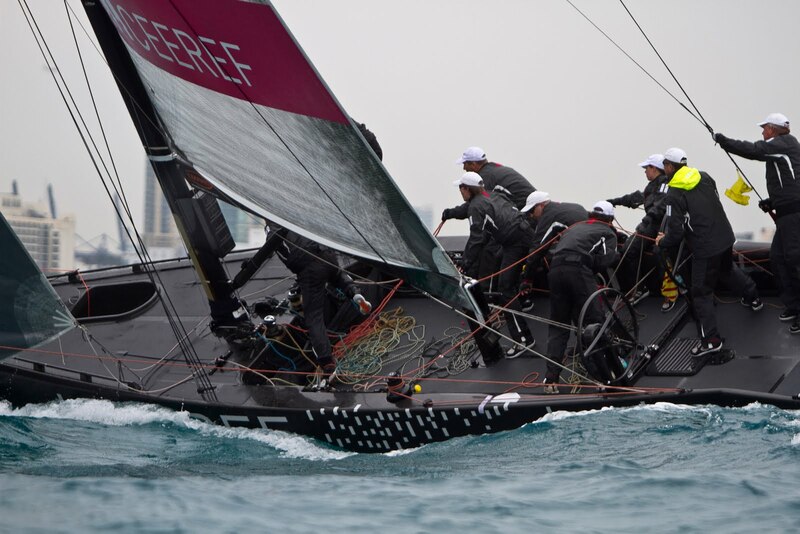 Copyright: Nico Martinez / RC44 Class. Team Aqua’s owner Chris Bake celebrates with his boys. "I am proud of this title", he said. "It’s a great testament to the team and the work Cam has done." Hutchinson and Artemis won the start of the race, but Appleton was able to get to the right side of the racecourse and then used the advantage of starboard tack to gain control of the match near the first mark. Team Aqua then fended off repeated challenges from Artemis to grab the double championship. “Terry did a nice job in the pre-start and won comfortably, but we broke free and took advantage of a right shift the guys saw, and that was the difference,” said Appleton. Copyright: Nico Martinez / RC44 Class. 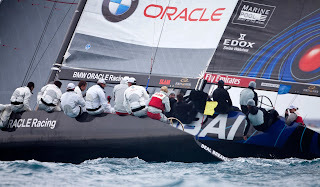 BMW ORACLE Racing (USA) against Sea Dubai (UAE). “Winning the match racing championship is a big highlight of the year. We feel we sailed well all year and the guys on board have done a fantastic job. It’s a strong crew to sail with,” Appleton said. 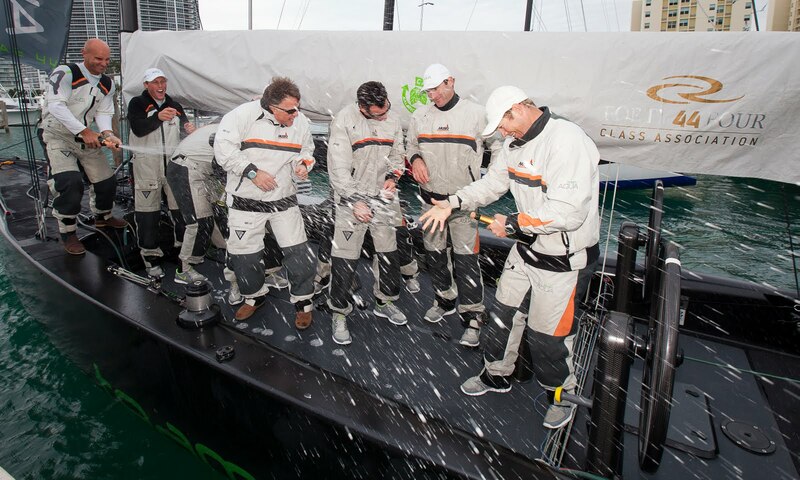 With the finish Artemis moved into second place in the match racing season championship, leap-frogging BMW ORACLE Racing, which placed sixth today and fell from a tie for first to third overall. Copyright: Nico Martinez / RC44 Class. Class Chris Bake’s Team Aqua, with Cameron Appleton at the helm, left no chance to Artemis, helmed by Terry Hutchinson. In other racing today Vincenzo Onorato’s Mascalzone Latino finished third with a victory over Synergy Russian Sailing Team, which placed fourth. 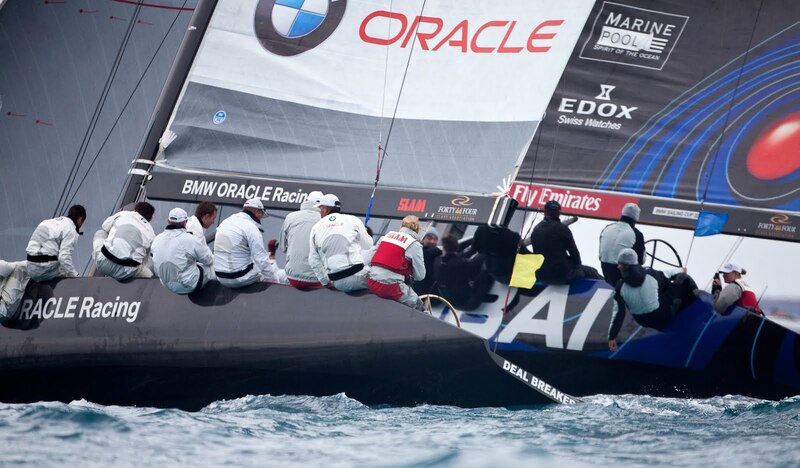 Team Sea Dubai placed fifth by beating BMW ORACLE Racing in a close match.